Buying bathroom vanities is commensurable with buying kitchen cabinets. But they are considered as the hardest working cabinetry in the house. They are constantly used up by every member of the house. You should have a clear vision of what you are planning for bathroom. Afterwards, you must look upon various bathroom designs and layout. Then accordingly set budget. Before starting any shopping makes sure that you are well aware of the plan for your bathroom recreations. 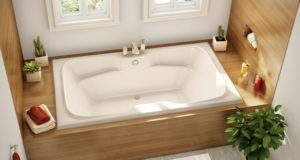 Size, location and space play a major role while selecting bathroom vanities. There are many choices available in the market but you must think upon various aspects before buying bathroom vanities of your house. It is mandatory to measure the space as you will get an idea about the approximate width, height and breadth you need to buy. Some of the key factors you have to keep in mind is- make sure that you leave enough space so that door can easily be opened; open the current vanity doors and measure against the dimensions of the bathroom; you have to be very clear so that, it won’t be too big and the one that disturbs the flow of traffic. What all features you like in the vanity which is still present at your place, just pen down or keep in mind the existing features of vanity like mirrors, outlets, space for each item and electrical switches. Bathroom vanities are also available in four grades as similar to kitchen cabinetry. Out of all possible quality available to us Ready-to-assemble is the cheapest cabinetry. After this, stock cabinetry is affordable but has very little varieties in styles, size and materials. If you want to go for wide range of door and drawer style then Semi-custom cabinets is good option. Custom built cabinets have no limits in terms of style and design. Thus one can go according to the budget. Regardless of what quality you choose for your bathroom, make sure that the cabinet you had chosen are well constructed with drawer. So if you want a bigger drawers or maximum drawers, then move ahead according to the need of the bathroom and pace available for it. It’s important to choose materials of bathroom vanity as it receives considerable wear and tear. Nowadays, the number of options is available in the market but the question is to select the best one out of it. You can choose woods and laminates. Before moving on to the option of design, you should think about what all stuffs you want to place in that vanity. Like, double sink vanity design offers more storage in comparison with narrow vanity, but narrower vanity will provide floor space. Freestanding vanities are good option if the space is small and it had wide variety of styles also. Moreover, it offers more countertop space and storage. You have to be sure enough that whether you want a vanity with or without top. Going for vanity with top is easier but there are very less variety of this kind of vanity. If you are buying a vanity without a top then variety of materials are available in the market. 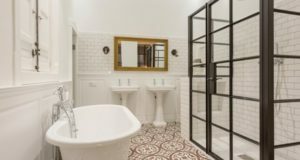 Bathrooms are generally spate from the remaining part of the house, so you can change the theme of bathroom according to your wish. If presently your house appearance is traditional then you can give a modern look to your bathroom. Vanities can be made with glass, metal or wood. All these kind usually comes in white, black or brown. If you want to give your bathroom modern look then you can paint the wood vanity with the color of your choice. Check out the description of vanity that you are willing to buy. Sometimes they already include the door and drawer hardware, you don’t need to think upon separately on this. 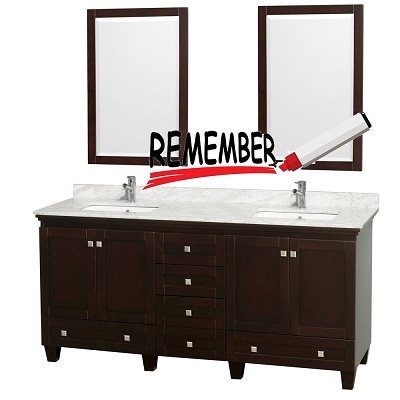 If you are buying the vanity for master bathroom then think upon particular items you want to place. Accordingly you can decide about the storage you want in that particular vanity you are going to purchase. Also you are using this bathroom every day, so have to place ample of items in the vanity. So storage according to the bathroom for which you are buying for is important. To give your bathroom a new look you can also think about the vanity which has matching mirror. Moreover, this will give your bathroom a modern look and addition of new theme as the things which are placed moves according to the look.